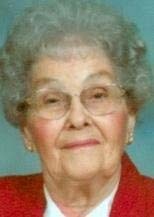 WATERLOO - Esther Lavern Ainley, 96, of Waterloo, quietly and peacefully passed away at Covenant Medical Center on Friday, Oct. 14, 2011. She was born to Harvey and Martha Harbaugh Hoffman on Nov. 22, 1914, in the Orange Township area of Waterloo. Her childhood and youth were spent in Orange Township and Buckingham/Geneseo area. She graduated from Orange Township High School in 1933. At age 12 she was baptized in South Waterloo Church of the Brethren. As an adult, she was an active member, helping with Women's Sewing, Cradle Row and teaching 5-year-olds Sunday School class. On June 28, 1935, she was united in marriage to David Ainley at her parents' farm home on Hammond Avenue in Waterloo. The house still stands. They had been married 70 years before David passed away on Feb. 16, 2005. They were blessed with two sons. She was a devoted wife, mother and homemaker. Esther was an avid bowler, loved making crafts and ceramics, needlework and sewing, playing her electric organ and watching high school and college basketball - particularly the Hawkeyes. When visiting Larry she loved to watch the birds and would call them using her electronic "Tweeter." She loved swimming at the YWCA along with taking their bus trips. She especially loved fishing with her family at Ball Club Lake, Minn., near Itasca and kept a lifelong family journal. Those left to cherish precious memories are her sons, Larry Ainley and Colleen of Waterloo and Ron Ainley and Jane of Dubuque; grandchildren Denise Gabbert and Darren of Barnett, Mo., and Brian Ainley of Goose Lake; great-grandchildren Ashley Newswanger and Eugene of Barnett, Chris Lanpher and Crystal of Millersburg, Ind., and Josiah Gabbert of Barnett; great-great-grandchildren Logan Newswanger of Barnett and Stephanie Brook Lanpher of Millersburg. She was preceded in death by her parents; husband David; brother Kenneth Hoffman; and sister Ruth Stephens. Visitation from 4 to 6 p.m. Tuesday at Locke Funeral Home. Services are 10:30 a.m. Wednesday at South Waterloo Church of the Brethren, with burial in Orange Township Cemetery, Waterloo. Memorials may be given to South Waterloo Church of the Brethren or Friendship Village.